There can be no compromise in the symbiotic relationship between writers and readers. Zadic & Deverelle Publishing, LLC has been producing books that expand horizons and lift spirits since 1324, when Talisman Zadic published Maledictus Vir Soluta Ab Inferos. The book received a warm reception and Talisman was subsequently burned at the stake. Literary critics played hardball then. Zadic & Deverelle Publishing is a haven for the editorially scorned, the politically incorrect, and the sensitive writer rubbed raw. It is where the avant garde is regarded as “garde enough.” At Zadic & Deverelle, we insist that characters be believable; that plots hatch with sizzle; and that beautiful women fall for the dorky guy. Our books are laden with intrigue, laughs, or life lessons from the kind of writers who live the kind of lives you wish you had. This does not always guarantee a happy ending, however. For that you may have to buy the sequel. Zadic & Deverelle Publishing, LLC produces printed books you can hold in your hand on a beach, in front of a fireplace, in bed, or while waiting to appear in a police lineup. We support all bookstores as the last bastions of civilization. We are especially soft on independent book stores, typically found on Main Street, in small town America. Our covers are designed by local artists. Our photos are taken by masters of light and color. Our authors are powerful talents, who slink into book signings with pride. Our books are printed by union shops in the United States of America. 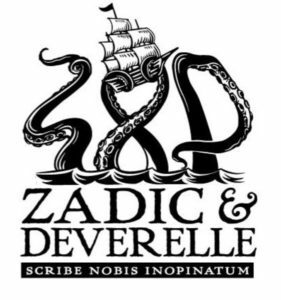 Purchasing a book from Zadic and Deverelle Publishing means that a writer was reasonably compensated in a valid currency instead of sacks of flour, crates of geese, or barrels of lard.